EduClasses is pleased to offer businesses, organizations, and governmental departments the opportunity to provide professional quality food handler safety classes to individuals working in the food industry. Successfully completing a foodhandlerclasses.com, ANSI-accredited, food safety course enables students to obtain the food handler card, food handler permit, or food handler safety certificate required by many state and local authorities for employment in the restaurant and food service industry. The food hander safety classes offered by EduClasses provide instruction on the proper processes and procedures involved in safe food handling. 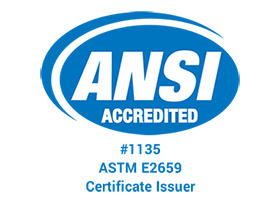 FHC, FoodHandlerClasses.com, has been recognized, approved, and accredited by the American National Standards Institute (ANSI). We believe professional training in an easy-to-use, standardized format will increase both the quality and production of food and food-related establishments while ensuring a safe and healthy environment for employees and patrons. Utilizing our web-based course in your business, organization, or governmental department will help to ensure "best practices" by providing a reliable standard of food handler training for those employed in the field. Offering an ANSI-accredited food safety course like the ones available from EduClasses not only benefits your employees and your organization, but demonstrates your commitment to the health and safety of our citizens and communities. EduClasses offers a unique bulk order system through FoodHandlerClasses.com that allows government agencies, organizations, restaurant owners and food managers the ability to purchase groups of food handler training courses for their employees who require food safety training. The bulk order system allows the purchaser to view who has redeemed their course, as well as the results from taking the course. After your employees have successfully completed their course, you will be able to view/print your employee’s food handler certificate. Thank you for considering FoodHandlerClasses.com and EduClasses as your training solution. By joining us in this effort, you are providing a much-needed forum for training in a key industry which can increase both the productivity and food handler student satisfaction rating of your organization. Go to www.EduClasses.org to learn more about our course offerings. EduClasses provides state-specific certificate courses for workers in a variety of industries. Drawing on nearly two decades of hands-on experience providing online solutions for businesses, educational organizations and governmental agencies, including website design and integration, EduClasses.org utilizes a custom suite of WebItems® Software, developed by DSBWorldWide, to continually upgrade our students’ experience with richer features and applications. EduClasses.org, through its family of online training courses, including www.FoodHandlerClasses.com, provides a food handler training certificate service via an online learning environment with integrated exam platform. This web-based service utilizes educational curriculum and exam materials provided by Grayson County Health Department. EduClasses.org is the only authorized food handler training certificate service permitted to use these materials. Grayson County Health Department maintains the food handler educational curriculum and exam materials updating them to meet the standards required for the ANSI accreditation / renewal process. Grayson County Health Department also ensure that the course and exam material meet the requirements for it to be certified by the State of Texas. Using the Online Food Handler Certificate Service has insured that our staff have their certificates in a timely manner. We just sit them down at a computer, they take the test at our location and not have to worry about class schedules or transportation. We highly recommend this service to anyone who needs it!